Houdini Helps You Escape From Your Car | OhGizmo! By Chris Scott Barr on 11/20/08 • Leave a comment! I’ve been lucky enough to never have been in a car wreck that left me unable to easily exit the vehicle. Unfortunately such situations do occur, and you really need to be prepared. You might think that taking off your seatbelt or breaking out a window wouldn’t be too difficult, however, seat belts can get jammed, and that glass doesn’t break as easily as you think. Enter the Houdini Automotive Escape Tool. This is certainly a tool that you always want to have, but never want to have to use. The Houdini features a protected blade for cutting away a seat belt and a spring-loaded glass punch. The glass punch does not actually take much effort to operate, simply hold it up to the glass, and it will take care of the rest. I’d recommend using your free arm to protect your face and neck. You’ll also find an LED light, whistle and key ring. Sure, it might not be the coolest keychain out there, but it could end up saving your life. 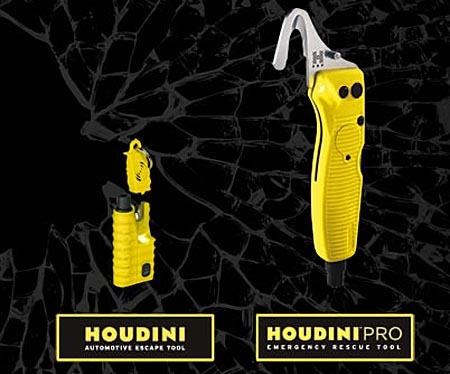 The Houdini will only set you back $25, while a larger Pro model (aimed at rescue workers) sells for $40.